What Is HEVC? Why Is It So Important for 4K 8K Video Encoding? We're in an era with growing demand for video, esp. HD and 4K/8K UHD video. It's reported that online video accounts for 73% of all internet traffic in 2016 and will grow to 82% by 2021. And internet video traffic will experience a rocket-fueled growth, roughly four times from 2016 to 2021. Meanwhile, we create scads of HD/4K UHD video sources each day with the rapid development of our iPhone, Android device, camcorder, GoPro, drone, etc. video recording devices. These cause heavy burden on global networks and our space-limited devices. And it's also trendy to use 4K or even 8K to broadcast the great ceremonies like London Olympics opening and	closing ceremonies shot in Ultra-HD 8K resolution. In such cases, the traditional H264/AVC codec can't satisfy the growing needs and a more advanced video codec with higher coding efficiency and higher throughput is highly demanded. Well, here comes the question: which video codec features higher coding efficiency and higher throughput? The answer is HEVC (High Efficiency Video Coding). What is it? Why say so? Is HEVC widely used? All your doubts can be answered in the following parts if you have really little acquaintance with HEVC (H265). Now, let's get it started with what HEVC is. Part 1 - What is HEVC? Part 2: What Are the Pros and Cons of HEVC? Part 1: What is HEVC? 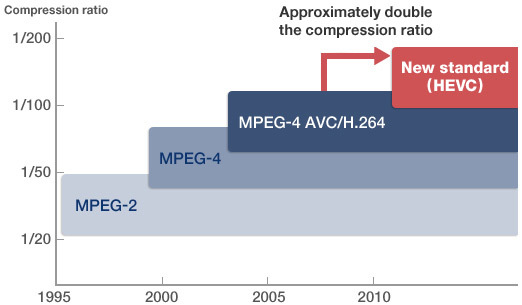 HEVC, the successor to H264, is a video compression standard that encodes video at higher coding efficiency and higher throughput, almost double the compression ratio compared with H264 and keeping the equal high quality or even slightly better quality. HEVC (H265) is widely used in encoding 4K/8K Ultra HD video due to higher coding efficiency to make large-sized UHD file size smaller. You may wonder why HEVC can reach 2 times higher coding efficiency than H264 while keeping the same level of high quality. You will become clear-minded after you read the HEVC improvements on coding tools. 1. What Improvements Does HEVC Make on Coding Tools? Larger coding blocks are achieved in HEVC, which develops from H264 16x16 pixels macroblocks to 64x64 pixels coding tree unit (CTU) for better 4K/8K Ultra HD video compression. Each macroblock in H264 is	either	inter	or	intra	coded while CTU in HEVC can	have	a combination of inter and	intra	coded	blocks. More flexible coding block structure is applied into HEVC codec. 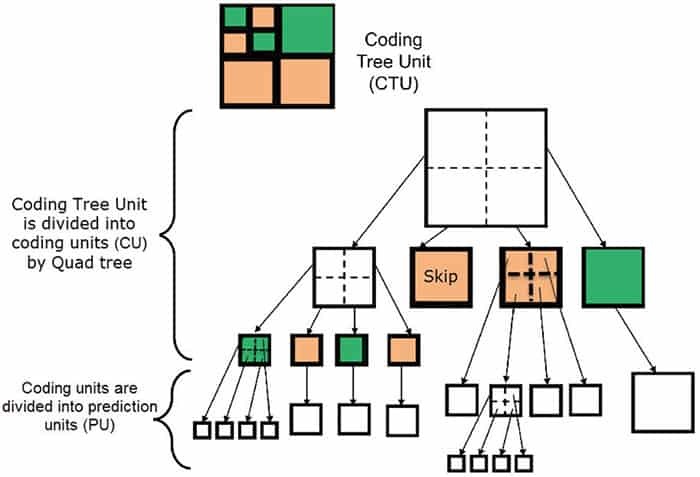 HEVC (H265) uses Quad tree to divide CTU into many Coding Units (CU) at different sizes, usually 2Nx2N (N=4, 8, 16 or 32) and each CU can separately complete the prediction, transform and entropy coding. 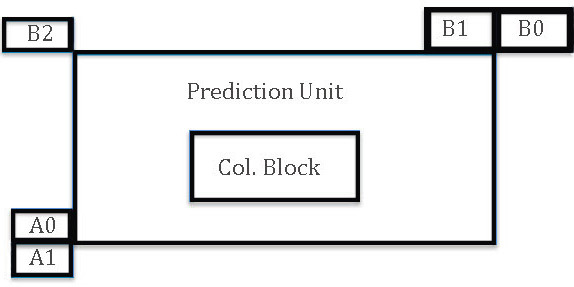 And each coding unit can have one or more prediction units (PU). As for intra prediction CU, there are two methods of partitioning: 2Nx2N and NxN. As for inter prediction CU, there are four normal methods of partitioning: 2Nx2N, 2NxN, Nx2N, NxN and four AMP (anysmetric mode prediction) methods: 2NxnR, 2NxnL, nRx2N and nLx2N. When it comes to compare H264 with H265 (HEVC) in intra prediction, H264 is instantly overshadowed. H264/AVC has 8 directional modes while HEVC has up to 33 directional modes. Comparatively, the directional prediction provided by HEVC will have higher accuracy. What's plus, all block sizes defined in HEVC can be supported by the planar prediction mode while in H.264/MPEG-4 AVC, only the block size of 16x16 pixels has such prediction mode. H264/AVC adopts the quarter-pixel interpolation motion compensation. To be specific, H264 uses 6-tap filter for half-sample positions, bilinear interpolation for quarter-sample positions and 1/8 sample bilinear interpolation for chroma. Comparatively, HEVC (H265) utilizes 1/32 pixel interpolation for intra prediction, 8-tap filter & quarter-pixel interpolation for inter prediction and 4-tap 1/8 pixel interpolation for chroma. Furthermore, the pixel bit depth inside of HEVC gets dramatically enhanced (IBDI supported up to 12bit) and the high-pixel precision bi-directional motion compensation is also achieved in HEVC/H265. Unlike H264 with motion vector prediction of neighboring samples, HEVC is improved with more sophisticated AMVP (Advanced Motion Vector Prediction) technique grounded on the competitive mechanism. To put it simply, the prediction units from top, left or neighboring positions (5 in total) can all be the candidates of predicted motion vector (PMV) and the HEVC encoder will choose two from them (if there is no enough PMV to choose from, then use "0" as another PMV) to count the rate-distortion cost. Among them, the one with lowest rate-distortion will become the final PMV winner and its index number will get coded. The deblocking filter in H264 performs on every 4x4 block edge while HEVC does it on every 8x8 block edge, which exceedingly improves parallel processing. That's because each 16x16 CTU is in possession of 64 pixel edges, 8 edge calculations and all 8x8 sample grids in HEVC/H265 are independent while each	macroblock in H264 owns pixel edges up to 128,	32 edge	calculations and each 4x4 sample grid in H264/AVC has to count on neighboring 4x4 grid. Another improvement in HEVC is that only three DBF strengths of 0 to 2 are running on HEVC. And the DBF in HEVC (H265) follows certain rules to process: firstly horizontal filtering for vertical edges to the image and only when it's done, it continues to use vertical filtering for horizontal edges to the image. This working principle creates an excellent environment for multiple parallel threads to be used for the DBF. H264/AVC places deblocking filter in the circuit of the motion compensation so as to remove blocking artifacts, protect the details of the picture and improve the image quality. H264/AVC firstly counts the strength of filter based on the property of the microblock and motion tendency and then conducts filtering processing grounded on 4x4 sample edge. The complete in-loop filtering of HEVC also includes Sample Adaptive Offset (SAO) besides deblocking filter. The SAO in HEVC is mainly used to address local discontinuities: edge offset and band offset, which can be achieved by two steps: divide the reconstructed image into 4 sub-regions (or offsets) in a recursive manner (0, 90, 135, 45 degrees) and apply one of 4 offsets	building on the values of the neighbors. 2. What Is The Coding Architecture of HEVC? From the coding architecture, HEVC follows the traditional mixed coding architecture, no revolutionary change. It still uses transform, quantization, entropy coding, intra prediction, inter prediction, in-loop filter and more modules. Yet, in the whole architecture, HEVC introduces new coding technologies into almost every module to significantly improve HEVC coding efficiency. Part 2 - What Are the Pros and Cons of HEVC? 1. H264 vs HEVC vs VP9: Any Difference? HEVC has come into the limelight these days since Apple has widely used it in its product line like iPhone, iPad, MacBook/iMac with macOS High Sierra, etc. And it's also crucial in 8K 4K Ultra HD video processing since it has 2 times higher compression ratio than H264 for 4K/8K video compression. That being said, it still can't account for the majority of the entire video codec market, since there is another powerful yet active competitor VP9 (developed by Google and supported by Chrome & YouTube). Well, which one is better and which one is to choose? H264, HEVC or VP9? Read the video codec comparison below and overcome your doubts. VP9, the successor to VP8, keeps the same standard as VP8 and can be accessible and available for free without price licensing. Unlike VP9/VP8, HEVC and H264 require license based on different devices, platform and regions. The above table shows the video encoding quality differences among HEVC, H264 and VP9. Smaller figure means higher quality in video encoding. In the total score, HEVC gets 0.671, H264 gets 0.68 and VP9 gets 0.67. So HEVC and VP9 are almost identical in the encoding quality. And comparatively, only H264 is a little bit inferior to HEVC/VP9 in encoding quality. In the encoding time comparison, it's crystal clear that VP9 has an edge over HEVC regardless of 1080p video encoding or 4K video encoding. And the time consumption of VP9 encoding is much shorter than HEVC, almost 2.5X less time in 4K encoding and 3.5X less time in 1080p video encoding. Meanwhile, H264 stands head and shoulders above the rest two video codecs, 4.5 times faster than HEVC and 1.3 times faster than VP9 in encoding 1080p video. And in 4K video encoding, H264 runs 3.3X faster than HEVC and 1.4X faster than VP9. To sum up, in the video encoding time comparison, the gold award winner is H264, followed by VP9 and the bronze-prize winner is HEVC. That's mainly because the coding techniques and algorithms used in HEVC are more complicated than H264 and VP9 in order to encode video at the lowest possible bit rate while keeping high quality. From the test result, we can find that the video decoding efficiency of HEVC and H264 is higher in 5KPlayer than that in VLC, especially decoding 4K video with 13% less CPU usage. As for VP9 video decoding, the video decoding efficiency is much higher in Firefox than that in Chrome, 11% less CPU consumption in decoding 4K 2160p video. And to just compare these three video codecs, obviously H264 consumes the least CPU utilization, HEVC takes the second place and VP9 is inferior to the rest two codecs. To sum it up, H264 overshadows HEVC and VP9 in video encoding speed and the CPU consumption of video decoding. HEVC beats the pants off H264 and VP9 in video compression capability and output quality. And VP9 is in the middle for most part, no matter output video quality, compression ability or video encoding speed. Considering the actual test comparison is limited by both time and space, it's unlikely to test all the sides to conclude the HEVC advantages disadvantages. Therefore, for those who are itching to know more pros and cons of HEVC, please read on the next section with concise conclusion. HEVC gets great progress in video coding techniques and algorithms like the advanced CTU, stronger parallel processing, more flexible motion compensation, more powerful intra prediction (from H264 10 modes to HEVC 35 modes) and inter prediction, etc. to reduce almost 50% bit rate and provide 2X higher compression than H264 while retaining the same high quality level. To be specific, compared with H264/AVC, HEVC (H265) applies high coding efficiency to make a bit reduction of 52% at 480p and 64% at 4K Ultra HD. This benefits 4K and 8K UHD video popularity a lot and can also largely save storage space for your mobile device like iPhone X/8/7, iPad Pro, Galaxy Note 8 when recording 4K UHD video thereon or transferring 4K video to mobile devices. MacX Video Converter Pro (free download ) to convert and compress video to HEVC/H265 (hvc1/hev1) codec with less than half of the file size and 98% quality reserved (High Quality Engine & optimized transcoding engine). Thus, your 32GB iPhone 7 can be expanded to save 2-hour 4K video files in HEVC from the previous 1-hour 4K video in H264 and 64GB iPhone X/8/Plus easily saves 4-hour 4K HEVC video files. Entropy coding context-adaptive binary arithmetic coding (CABAC) algorithm is used in HEVC as well as H264. But the difference lies in that HEVC uses CABAC as the only entropy encoder method while H264/AVC adopts two entropy encoder methods. CABAC and the entropy coding of transform coefficients in HEVC are designed for a higher throughput than H.264, which can satisfy the growing demands of 8K/4K Ultra HD video broadcasting at even 120fps. Basically, the entry level of internet speed for HD video streaming is 5Mbps. When it comes to streaming 4K Ultra HD video, the minimum standard of bandwidth should be 13 Mbps for Hulu video streaming, 15Mbps for Amazon video streaming (25Mbps for Amazon Prime Instant Video) and 25Mbps for Netflix video streaming. And if you have the 8K video streaming, you're supposed to start at 50Mbps. Remember these requirements don't take other devices (also consume bandwidth) into consideration. Things become much better when HEVC (H265) is applied in 4K/8K Ultra HD streaming. You just make sure there is at least 12Mbps bandwidth available for 4K HEVC x265 video streaming and 25Mbps bandwidth for 8K UHD streaming, almost half of the network bandwidth saved. In the mobile streaming market, HEVC is able to reduce 30% - 50% bit stream, which helps the mobile network operator transmit less data under the same high quality condition than before. Thus, the cost of video network distribution can be saved to a large extent. Color depth or bit depth refers to the number of bits that the color of a single pixel can have. Usually, the 8-bit color depth has 256 possible values for red, green and blue, 10-bit color depth with 1024 values for RGB and 12-bit color with 4096 values for RGB. Higher color depth means more delicate gradient ramp. And the reason why HEVC upgrades bit depth from 8bit to 10/12 bit is to reduce color banding. Compared with HEVC 8 bit, HEVC 10 bit has 4 times more values than 8 bit, which can make color banding invisible without dithering process. Consequently, the HEVC 10 bit video is usually smaller than HEVC 8 bit video in file size with the same level video quality. The same applies to HEVC 12 bit and 10 bit video. HEVC, built-in with an enhanced CTU segmentation and improved parallel processing tech, as well as a better motion compensation and more powerful in-loop filter require almost 10x more computing power for video compression. Currently, though scores of software and video players claim to support HEVC x265 decoding and encoding, hardware configurations are still the basic condition, especially the configurations of CPU and GPU processors (GPU hardware acceleration plays a big role in HEVC hardware encoding). HEVC (H265) is patented by various parties and charged with different standards. The licensing price varies mainly based on the device types, unit price and regions. Royalty rates for mobile phone, tablet and laptop are priced at $0.4 per unit, plus up to 10 cents per unit if advanced profile is supported. As for consumer products like game console, set-top box, desktop, they're charged at different standards, partly grounded on the device selling price. If the selling price of the game console is $40.01-$50.00, then the royalty rate of the game console is $0.45 per unit. Providing the selling price of the surveillance camera is beyond $80, the royalty rate will be lifted up to $0.80 per unit. To know more royalty rate standards on more devices, please check this royalty rate summary from hevcadvance. 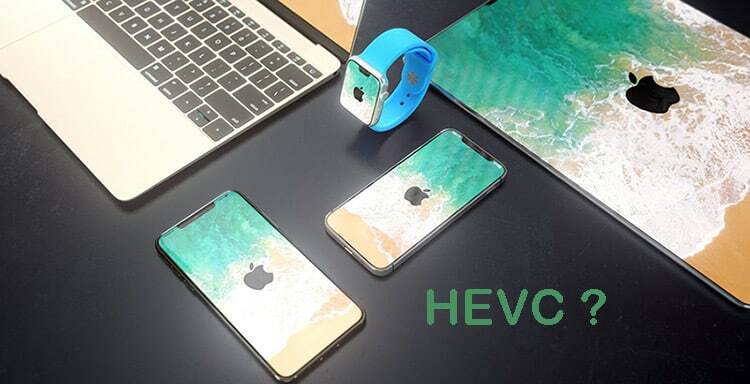 So far, only the latest devices and computers support HEVC x265 decoding and encoding, e.g., only iOS 11 iPhone iPad with at least A9 chip can support HEVC video playback and iOS 11 device with A10 or higher chip can successfully record HEVC video thereon. Thus, for most older devices, platforms and video players, they can't be compatible with HEVC codec. The current HEVC video source in 4K/8K/3D is limited and the related HEVC playback device are not well prepared. Even though the HEVC playback hardware has no problem, there is still high likelihood to encounter HEVC playback failure due to the lack of HEVC video codecs for HEVC decoding. This common HEVC playback problem can get solved, but some solutions are just a little bit troublesome. We've already known that the higher coding efficiency of HEVC comes at the expense of much more complex compression algorithms, which not only have higher demands on your computer hardware configuration, but also consume far more time in video encoding than H264/VP9 (the aforementioned test has proven it). Thus, HEVC is damn slow without hardware accelerated encoding. Solution you might need: HEVC is eventually here but still needs a long time to fight against H264 and win more market share since the supported hardware devices are quite limited. If you just happen to get some HEVC 4K videos but can't do anything to them on your gadgets because of the incompatibility issue, you're suggested to use the HEVC video converter MacX Video Converter Pro to hardware decode and convert HEVC (hvc1/hev1) to H264, MP4, MOV, MKV, AVI, FLV formats or iPhone iPad, Android, Microsoft, Google, Nokia, PS4, Xbox One, etc. 410+ mobile devices for playback/further editing without HEVC codec errors. What's plus, compared with software encoding, the hardware accelerated encoding (activated by HEVC encoder software) will generally improve HEVC 4K/8K video encoding up to 2-3X faster. Incredibly, MacX Video Converter Pro, (Nvidia/Intel QSV/AMD HW acceleration supported), can even make 4K 8K HEVC encoding speed up to 5-8X faster at 250-320FPS via the cooperation of GPU hardware acceleration, hyper-threading tech and multi-CPU (up to 8) utility. In the past, H264 dominated the online video streaming field and enables you to stream 720p HD 30fps video with at least 3.8 Mbps bandwidth, 1080p Full HD 30fps video at 8 Mbps. As for 4K video streaming in H264/AVC codec, Netflix requires at least 25Mbps and Amazon needs 15Mbps as the entry level. Thankfully, High Efficiency Video Coding (HEVC) is now widely used in online video (esp. 4K/8K) streaming that can save up to 50% bandwidth for you. Therefore, the application of HEVC/H265 codec is extended to various video streaming platforms including Netflix, Amazon, Hulu and more. Personally, the large-sized 4K or 8K UHD videos you have are limited in number, hundreds of videos at the most and the file size can't be too monstrous. Yet, that's a different story for the media company with big data, say 1PB (1 million GB). When the media company adopts HEVC/H265 codec to encode their video files, that will reduce 50% file size off and save big data files with 0.5 million GB. That's really a tremendous relief for the company storage burden. HEVC (H265) becomes more and more popular in video conference, for its higher throughput feature can bring you immersive experience. More advanced parallel processing, alongside with more powerful coding units, prediction units and transform units, makes multiple cameras at higher resolution (1080p/4K/8K) available in video conference. Thus, in business video conference, both sides can clearly see each other and contact with each other as if they communicate face to face via the multiple yet bigger display. Besides the usage in 4K/8K Ultra HD video field, HEVC is also a favourite of augmented reality video, 360 degree video, free-viewpoint video and 3D video. Take 360 degree video for example. In general, a 5-minute 4K 360 degree video would be around 5.5GB in file size. This is the conservative estimation on file size for 360° video at 150Mpbs bit rate. The 4K 360° video file size would be even larger if the video bit rate isn't purposely controlled. In such case, HEVC is the silver bullet to effectively compress 360 degree video, as well as augmented reality video, free-viewpoint video and 3D video without sacrificing quality. As is known to all, HEVC (H265) is peeking over the horizon mainly for Ultra HD 8K/4K video encoding and compression. Afterwards, the 4K/8K HEVC encoded video can be playback with much smaller file size while maintaining the equal quality or even better quality than H264/AVC. To play HEVC video on iPhone iPad or iPod, upgrade to iOS 11 first. The computer using the Intel Kaby Lake (or equivalent) processor and newer, plus Windows 10 or higher OS, theoretically enables you to playback HEVC video in 4K/8K Ultra HD. Yet, if you wanna use hardware acceleration tech (Nvidia/Intel QSV) to hardware decode 4K 8K HEVC for smoother playback, make sure that the Nvidia GPU starts with Maxwell (GM206) Quadro M2000 chip and that Intel CPU is at least Sandy Bridge Intel® Core™ i3/i5/i7 processor with Intel® HD graphics GPU or Intel® Iris™ graphics GPU. By the way, to activate HW acceleration for HEVC decoding, the software you're using like HEVC video player or HEVC decoder should support Nvidia/Intel QSV HW acceleration techs, as well. Note: Apple TV 4K and newer models support HEVC video playback. Yet, Apple TV 4 doesn't feature this HEVC playback function. Don't confuse Apple TV 4K with Apple TV 4. Beyond the above mentioned devices, there are still some other hardware devices and platforms with HEVC playback supported, including game consoles, GoPro, DJI Phantom 4 Pro, Roku 4, surveillance camera, YouTube, Vimeo, etc. To successfully play HEVC video on iPhone iPad, Android or other devices, you need to check the HEVC video parameters, as well before loading HEVC for playback. That's because different devices have different requirements on HEVC parameters like resolution, frame rate, etc. Take iPhone for instance. iPhone X/8/7/6s/Plus with Apple's A9 or newer chip can support HEVC video playback up to 4K 2160p resolution while iPhone 6/6 Plus only plays HEVC video up to 1080p at 240 fps and iPhone 5s is allowed to play HEVC video up to 1080p at 60 fps or 720p at 240 fps only. Hence, it's necessary to have a check on HEVC video parameters and properly tweak them building on the specific playback device. Download HEVC codec x265, DivX 10, K-Lite Mega Codec Pack or re-install Libav/FFmpeg (libavcodec) library on your computer. Then shut down the hevc player and re-open it to have a try. Convert HEVC to H264 codec for video playback with HEVC video decoder Handbrake, MediaCoder or MacX Video Converter Pro so that you can make HEVC video playback without the troublesome HEVC codec issues. Considering the HEVC to H264 conversion process is time-consuming, you're suggested to try MacX at faster speed, for only MacX supports hardware acceleration techs (Intel QSV/Nvidia/AMD) to hardware decoding, processing and encoding HEVC to H264, as well as MP4, MPEG-4, AVI, MKV, VP9, VP8, MPEG-2, etc. 180+ formats at 5-8X faster than any other programs. HEVC is an awesome video codec with higher coding efficiency, but it does have its shortages. Chief among them is HEVC poor compatibility. That partly explains why it's still in the early phases of development. Now, HEVC (H265) is fighting for a bigger piece of the pie while the next generation codecs are already being developed in full force. What are they and what do these futuristic codecs have to compete with HEVC? Read on the future of video codecs and you will be enlightened. AV1, the abbreviation of AOMedia Video 1, is the successor to VP9 and designed to mainly vie against HEVC. Unlike HEVC, AV1 is an open, royalty-free video compression standard that can offer about 30-40% more bit rate reduction than HEVC. That's to say, AV1 is even more efficient than HEVC in video compression, thanks to its improvements on data transformation, partitioning, prediction, quantization, filters and entropy coding. NETVC, aka. Internet Video Codec, is developed by IETF as a standardization project for a royalty-free video codec and an alternative to HEVC and H264/AVC. Similar to AV1, NETVC is also optimized with even higher compression efficiency and more importantly it features reasonable computational complexity to improve its compatibility. Until now, it's still in a state of development and the various spreading rumors can't be confirmed. The NETVC information will get constantly updated once it makes new progress. X264 vs X265: Which is Better in Video Encoding/Decoding? What's the Best Codec for 4K Ultra HD Videos: H264 or HEVC? Free download HEVC converter to encode video to H265. Try the best tool to convert H265 to H264 with intact quality. Simple way to convert HEVC (MKV) to MP4 for better compatibility. 4K H264 video too large? Convert 4K video from H264 to H265.